This is the first time I’ve done a book review on my blog and I couldn’t be more excited! This will be the first of many from within the Christian Speculative genre. For those not familiar with this label, it encompasses all things sci-fi, fantasy, and the like, that maintain a Christian world view. The authors may build an entirely new world in the future or the past, or they may simply introduce a single paranormal element that pulls you out of the real world and into theirs. This is the genre I weave my tales in. My goal is to open your minds and encourage you to look beyond what you can see and feel, and imagine. I want to take you along on a journey of ‘What if?’. I hope you enjoy reading these stories as much as I do! This book was gifted in exchange for an honest review. Though Shenandoah Nights is classified as historical romance, it contains a touch of the magical: time travel. In this first book of the series ‘Winds of Change’, Belcastro pulls us in and makes us believe that floating back through the years could be entirely possible. Sixth grade teacher Rebecca O’Niell has been roped into chaperoning a class trip aboard the schooner Shenandoah, though that is the last way she wants to spend a week of her summer vacation. The fact that the ship is rumored to be haunted only adds to her displeasure and trepidation. Five years ago another teacher, Melissa Smith, had complained of hearing voices and seeing visions, then disappeared without a trace. She had been staying in the same cabin Rebecca was about to occupy. Everything starts out normal and Rebecca finds herself enjoying the beautiful ship. Then she begins to hear voices while in her cabin that don’t sound like they’re coming from this century. Mike, a crewmember, is adamant about believing the island tale that Melissa time-travelled back to Colonial Boston. His habit of constantly shadowing Rebecca rattles her nerves, already frazzled by the experiences in her cabin. Her first night on board, she drifts off to sleep and wakes up the next morning with memories of a secret conversation about a battle with Britain. The next night, she crawls into bed after an adventurous day of sailing and swimming, only to be startled awake when a man grabs her arm and yells, “Stowaway!” She is dragged in front of Captain Benjamin Reed and looks up into the most gorgeous brown eyes she has ever seen. How is it possible that she keeps sliding back and forth between the present and the past? What really happened to Melissa? Will she be stuck in the past or can she return to her own time? With her growing feelings for the handsome Colonial Captain, will she even want to return? Belcastro gives us an exciting story, mingled with history and seasoned with romance. The main character Rebecca is a woman who loves her job as a teacher, but is distraught over the fact that her job and her best friend, Tess, are really the only things she has to focus on. She has yet to find love and most of her family is gone. This character is well written and I felt a connection to her immediately. She has depths that are revealed carefully over the course of the story, adding to the richness of the character. Her quirky sense of humor is definitely a plus. What’s a good historical romance without a swashbuckling, handsome, rugged hero? Benjamin Reed is exactly that. What he is not is obligatory mind candy. He is loyal and devoted. He’s complicated and simple at the same time. This character may be gorgeous, but he is not shallow or predictable. His growing desire for the mysterious woman on his ship confuses and infuriates him. He has to weigh his feelings for her against the desire to protect his crew and his patriotic cause. The chemistry between these two is electric and instantaneous, but not forced. It seems natural and we are swept along in its wake. I’ve never been a fan of the sappy and overused device of love at first sight. However, Belcastro works this budding romance perfectly. Even though they both feel the spark the second they are introduced, they are frightened and leery of it. It’s not a tale of immediate love and it is not by any means trite. I loved how the progression of the relationship was dealt with. It had me cheering them on and yet nervous and unsure at the same time, experiencing the emotions right along with the characters. The time travel element was dealt with beautifully. The way she worked it, there was no strange contraption or scary and annoying scientists flitting about and getting in the way of the story. It was simple, elegant, and worked seamlessly into the setting. I was pleasantly surprised. As picky as I am, you would have thought there would be several things I would pick apart or have a problem with. There was only one thing that bothered me. The first mate of the present day ship, Hawk, plays a big role from the beginning, which is fine. The thing that bugged me was that it almost felt like the stage was being set for a love triangle. He was gorgeous and there was an instant attraction. He also seemed to be genuinely concerned about her welfare, a bit more than just the norm of wanting to protect guests under his watch. We are lead away from that track later, but it still gave me pause. Then again, maybe I was reading too much into it. I’ll let you decide. It still did not detract from the story or diminish the plot. Overall, I was very pleased and thoroughly enjoyed it. This book will have a wide range of appeal. It crosses genres with fluidity and grace and will ensnare the most die hard historical fan while snagging the sci-fi fans as well. Action, adventure, slight comedy, romance, and magic. 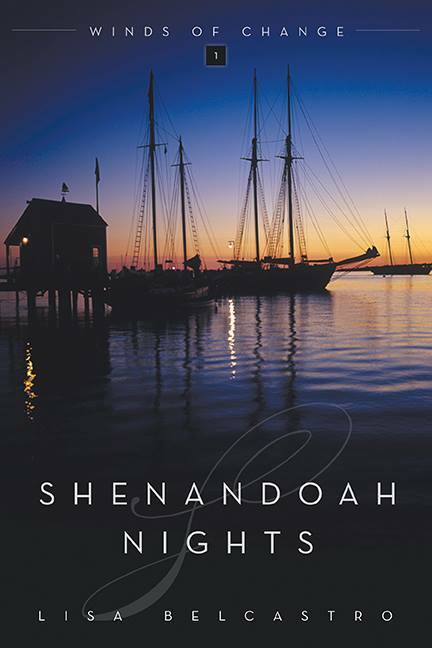 Shenandoah Nights has it all. I would highly recommend this book to anyone. It has Christian themes, but doesn’t bash you over the head with them or get all “preachy”. I think even someone who doesn’t generally read Christian fiction would find this clean romance enjoyable. Now that you’ve gotten a glimpse inside the pages, what are you waiting for? Get your hands on this tale! I promise you won’t be able to put it down. Available on Amazon, Barnes and Noble, Christian Books, and Oak Tara in paperback or e-reader versions. Stay tuned to this blog, as we will be posting a feature interview with the author Lisa Belcastro and a chance to win a copy of your own! If you are a history buff or just like to hear from the person behind the story, you won’t want to miss this! Details coming soon. Want to know more about the author and her other works? Check her out on Facebook and Twitter! An interview and giveaway with award-winning author Lisa Belcastro!